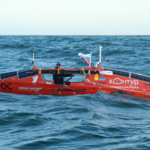 On Tuesday, May 16, at 6:47 a.m. New York time, Aleksander Doba (nicknamed Olek by his friends), after a five-day stop in Barnegat Bay, New Jersey, ventured again into the open waters of the Atlantic Ocean, to continue his Third Transatlantic Kayak Expedition. The storm that forced the kayaker to temporarily change his planned course ended on Sunday afternoon. 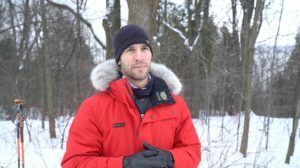 However, for the next weather window of opportunity that would allow him to exit the safe bay area, Olek had to wait another two days. In the nomenclature of sailing, and perhaps more so in kayaking, the weather window means the conditions for collision-free departure from the harbor – first and foremost, the appropriate wind force and direction. In this case, Olek needed the wind to blow from the west or northwest. Additionally, the weather conditions had to be coordinated with the ocean tide cycle. “The tides are very important here, because the channel connecting the ocean with the lagoon is almost 2 kilometers long and only a few hundred meters wide, and yet the course marked by the buoys is a little twisty. Departure should occur at the lowest water level. That is what the local fishermen have recommended to me,” Olek explained just before heading out into the Atlantic. The kayaker had to enter the open ocean during the last phase of low tide, just before the high tide, when the waves in the water had calmed slightly. It was extremely difficult to determine the date and time of the possible start. In the past five days, they have been changed many times due to the whimsical nature of things. 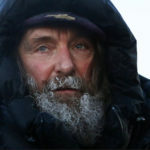 The anticipated improvement of the conditions on Monday also proved to be a little illusive, as Olek made his first attempt to get into the ocean that evening. Still, strong winds and high waves blocked him in the harbor. The next decision came aboard his kayak early on Tuesday morning and it was made very fast, in just a few minutes, when the water condition was stable enough for the kayak to safely leave the bay. 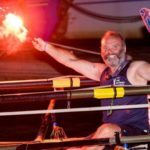 This time, Olek managed to take a course towards the ocean-leading channel, waving farewell to his small support team with Dorota Kasprzak and Malgorzata Borowska-Piatek on the shore, and Adam Rutkiewicz, Luis Muga, and me watching him from aboard the speedboat of Captain Alan Thomas. We escorted him for about 3 nautical miles from the shore. Now, Olek is facing a serious challenge. He has to cover at least 120 nautical miles off the coast of the United States to reach the Gulf Stream as soon as possible. This strong current, traveling with the speed of 1to 2 knots, creates a river-like path in the middle of the Atlantic and should help to keep the kayak moving forward in its waters, and in the case of storms and winds, prevent its retreat. 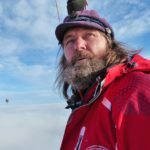 According to the forecasts sent by expedition navigator Jacek Pietraszkiewicz, Olek has about three and a half days to reach the Gulf Stream. 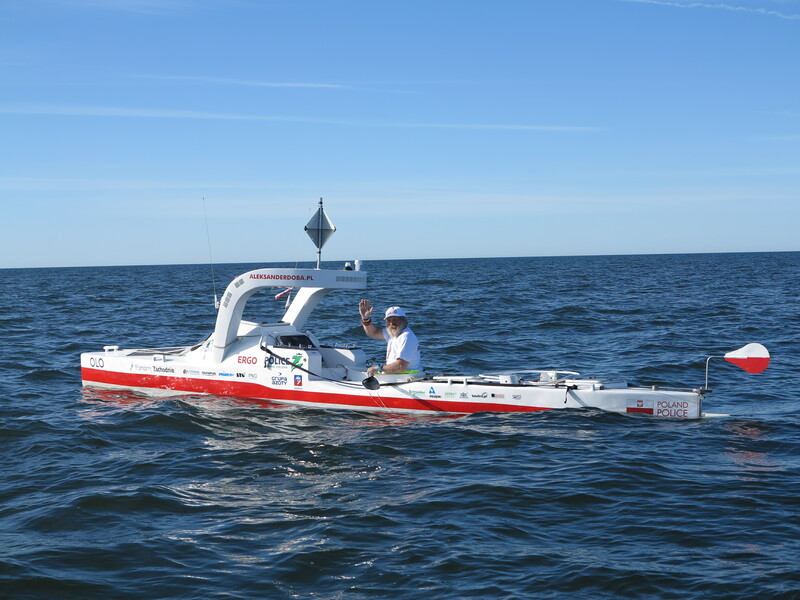 The present stage of the Third Transatlantic Kayak Expedition, which runs from Barnegat Bay to the Portuguese coast, will allow Alexander Doba to realize the main purpose of the expedition, a solo ocean passage from the North American continent to Europe. To recall, the first stage of the journey started on May 29, 2016 at Liberty Marina in New Jersey and ended on June 2, 2016 on the Sandy Hook peninsula. During the second stage, Olek left Sandy Hook on May 7, 2017 and reached Barnegat on May 11. Now, the kayaker will face the longest stretch of at least 3100 nautical miles. Let’s hope that Neptune finally has his graces for Alexander Doba. 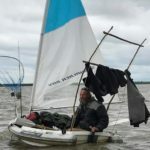 Just in case, at the request of expedition navigator Jacek, just before leaving the Barnegat Bay, the kayaker followed an old sailing tradition and “bribed” the sea god with a glass of whiskey poured into the Atlantic waters. In Lisbon, he will offer him the whole bottle.